· Bike Cover and forget about rough weather conditions. The bike cover is waterproof which safeguards your bike from rain. · Durable Material:- Made with premium-quality fabric material, Supreme Silpaulin Quality Bike Cover will last you a longtime. Sturdy and robust, the fabric does not give away easily. · Suitable in All Weather Conditions:- Suitable in All Weather Conditions Humid or dry, rainy or stormy, Supreme Silpaulin Quality Bike Cover comes in handy. The material is compatible with all kinds of weather. · Helps Prevent Bike Scratches:- The high-quality fabric of Supreme Silpaulin Quality Bike Cover has an inner fleece lining that helps prevents scratches on the bike body. The smooth fabric glides like butter over your bike. 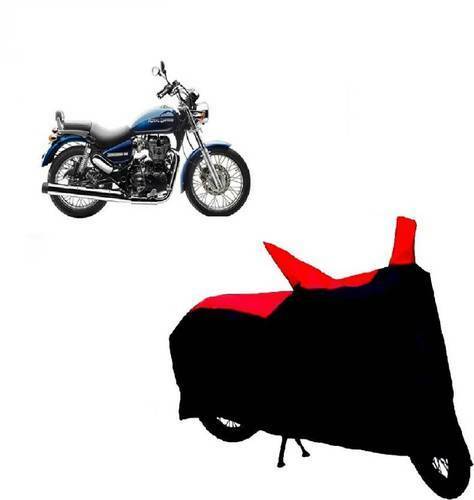 · Quality Bike Cover is designed in a way that it will be a perfect fit the motorcycles like Avenger, Royal Enfield Bullet, Classic, Thunderbird etc. It will cover your bike protect it from dust, pollution and rain. · · Silpaulin Premium Quality Bike Covers are indispensible products of service that protect your Bike from dust, scratches Weather Extremes, Fading Away From Sunlight. · · Bike covers help prolong the beauty of the Bike while protecting it from the harsh weather conditions. · · A must have product for a real Bike lover who wants to keep their Bike in new like condition. · · Easy to fit High Quality Fabric Water and heat resistant Covers entire body of the Bike Extremely lightweight and durable Tie-strap with a heavy 2' buckle lock to hold cover in place. Established in the year 2012 for manufacturing & wholesaling 700 product last 3 years all india via SNAPDEAL,FLIPKART,PAYTM,SHOPCLUES & many other online companies . Our mission is to satisfy our customer with product quality. AND ALSO 645 PRODUCTS COMING SOON .